June 2013: UPDATE: inside Suri's vacation! 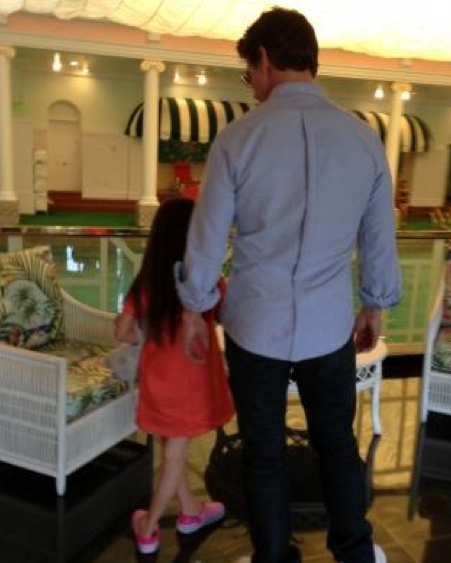 one more photo of Suri & Tom spending time together after arriving at The Greenbrier Resort in West Virginia for the weekend of June 8th 2013.
and a new Fashion Low for Suri - Pink Crocs!!! June 2013: Suri & Tom Vacation in VW! Suri Cruise and Tom pictured arriving at The Greenbrier Resort in West Virginia for the weekend of June 8th 2013. Suri & Tom enjoyed the pool and nice weather together! HUGE Thanks to Leana for the photos & info! 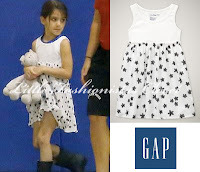 outfit info: White & Black Star Print Dress from TG Havana line SS'11 by GAP. 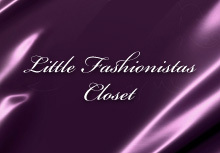 In Suri's Closet - Mi Mi Sol Sandals! Suri was wearing Sparkling Jewel Pink Sandals SS'13 by Mi Mi Sol, while arriving back to NY on May 27th 2013. Suri was wearing Grosgrain Tie Fuchsia Sandals SS'13 by Mi Mi Sol, while out in NYC on May 6th 2013. Thanks to Fleurisse Lover for the id! June 2013: Suri goes to school on Friday! Suri arrived to the Avenues School on a rainy day in NYC on June 7th 2013. 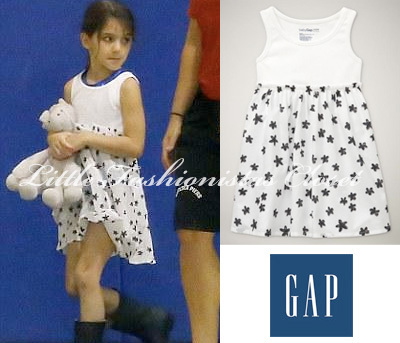 Suri was wearing White Melody Blouse FW'12 by Bonpoint. outfit info: Gommette Red Ballerinas from Jeune Fille Collection by Roger Vivier (first worn on June 27th 2012).